The Fab Four transcended pop culture. No matter how one feels about their music, the Beatles undeniably have been mythologized. 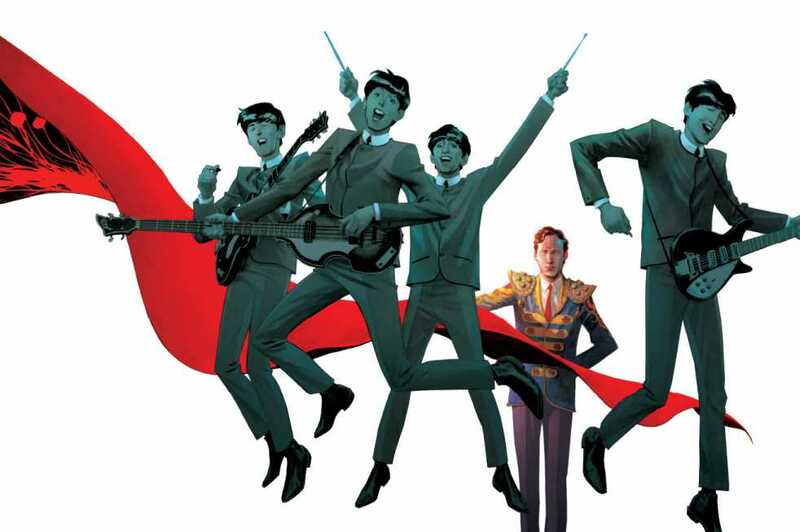 This is easily demonstrated, and purposefully played with, in the title of Vivek J. Tiwary and Andrew C. Robinson’s graphic novel The Fifth Beatle. Brian Epstein was the Beatles’ first manager, the young man who felt his destiny was to introduce the world to the nascent band. The Fifth Beatle is primarily Epstein’s biography, but a biography defined by his involvement with the Beatles. The only backstory one gets of Epstein is a brief flashback paralleling his various past rejections with his early attempts to secure a record deal. Besides that, the graphic novel details only his life in relation to the band and ends with his early death shortly after the release of the album Sgt. Pepper’s Lonely Hearts Club Band. The story balances his professional struggles of elevating an unknown local band into a music phenomenon with his personal struggles. Both make equally compelling reads and results in sharing common themes and symbols, particularly Epstein’s fondness for bullfighting. The dialogue is snappy and Tiwary manages to give the main characters distinctive voices, a skill not many comic writers are able to pull off. In particular, the band members speak in a charmingly weird and collaborative fashion, as if they were always writing lyrics to their own lives. The story’s main weakness is the pacing. It has a tendency to feel disjointed because major chunks of time are skipped page by page. Getting the band a record deal, Epstein’s first major challenge, is solved in a short amount of reading. While the entire graphic novel makes sense plot-wise and delivers a satisfactory emotional conclusion for Epstein, the individual sections can feel rushed. In terms of art, the book is stunningly beautiful. Savannah College of Art and Design alumni Andrew C. Robinson draws most of the novel and takes up colorist duties as well. Ethereal atmospheres dominate the panels, enhanced with ample use of vivid color; nothing in this book is muted or subtle in colors. Fantasy and dream sequences are drawn with the same style as the real parts of the book, causing that hallucinatory quality to bleed into reality. However, there is still deliberate care in depicting the characters. Epstein and the Beatles are instantly recognizable but allowed to express themselves in the exaggerated expressions granted comic characters. They are real people drifting amidst vibrant, fantastic settings. In other words, the art is reminiscent of how a Beatles song would look; beautiful characters cloaked in the unreal. Kyle Baker draws a small section depicting the Beatles’ disastrous trip to the Phillipines. A drastic change in style, this section is presented satirically. The characters are caricatures and run around animatedly as if in a cartoon show. It fits the section’s subject and does not overstay its welcome. The Fifth Beatle fails as pure biography because it does not want to be pure biography. It succeeds in educating readers in the life of the man who, arguably, is the reason the Beatles became gods of music. Following a prevalent theme of the band it follows, the book presents Brian Epstein’s life with a shroud of fiction that expounds upon the facts of his life to elevate it into something tragic, beautiful, something mythic.